iRig Keys I/O is a solid and versatile option for singers, guitarists and bass players that want an all-in-one option for keyboard, controller and audio interface. The iRig Keys I/O is an all in one midi controller keyboard and USB audio interface for use with your Mac/Pc/iPad/iPhone. Available in 25 key ($199 / €199) and 49 key ($299 / €299) versions, the iRig Keys I/O comes complete with a bundle of software and apps and ability to handle 24bit 96kHz audio. 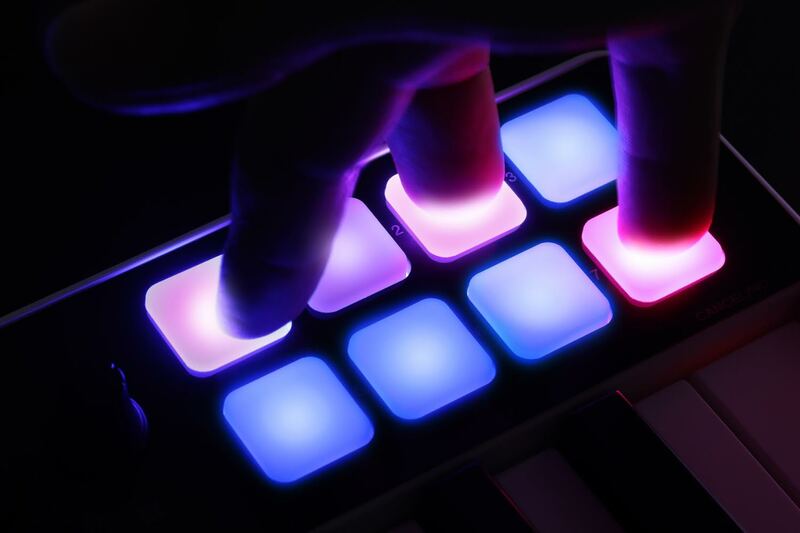 The keys are full size and have velocity sensitivity as do the 8 multicolored light up drum pads. There are also programmable touch strips (2 on the 25 key, 4 on the 49 key) that can be used for pitch bend, modulation or other parameters you assign to them. The back panel is where you get to see what sets the iRig Keys I/O apart from just being another midi keyboard with pads. There is a combination input jack for line, instrument or microphones with a gain control. A red/yellow/green indicator light next to the display helps you set an appropriate gain for your input. If your Mic requires phantom power a 48V phantom power button is included. You also get a headphone output and separate balanced stereo output that can be used with monitors or to send sound to the mixer board in a live setting. There is even an input for a Footswitch/Expression Pedal. 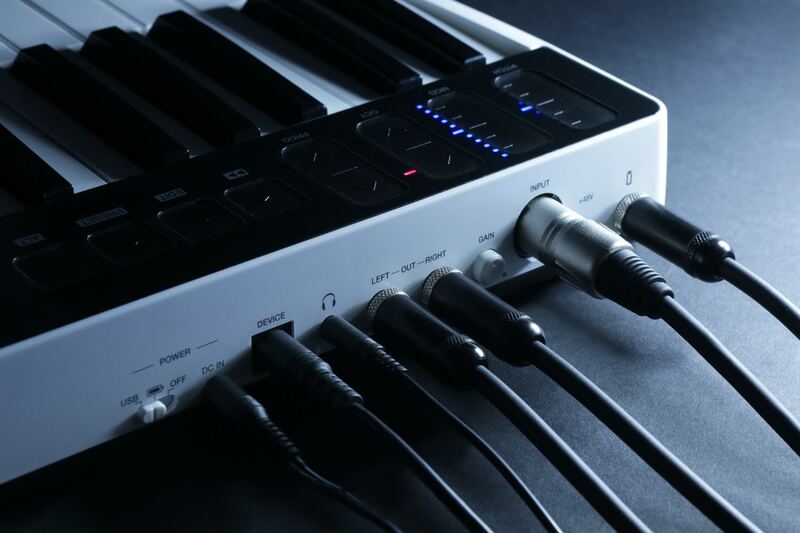 The iRig Keys I/O can be powered by 4AA batteries or take its power from USB. With the external power supply (sold separately) it can also keep a connected iPad charged during use. A USB cable and a Lightning cable are included though these are just a few inches shorter than would be a sensible length. At the time of writing this is the only portable all in one controller and audio interface device on the market. Programming is fairly simple with a combination of the Edit/Preset buttons and the data entry knob which is a simple twist to scroll through the menu options displayed on the small 3 character display and a push to select. 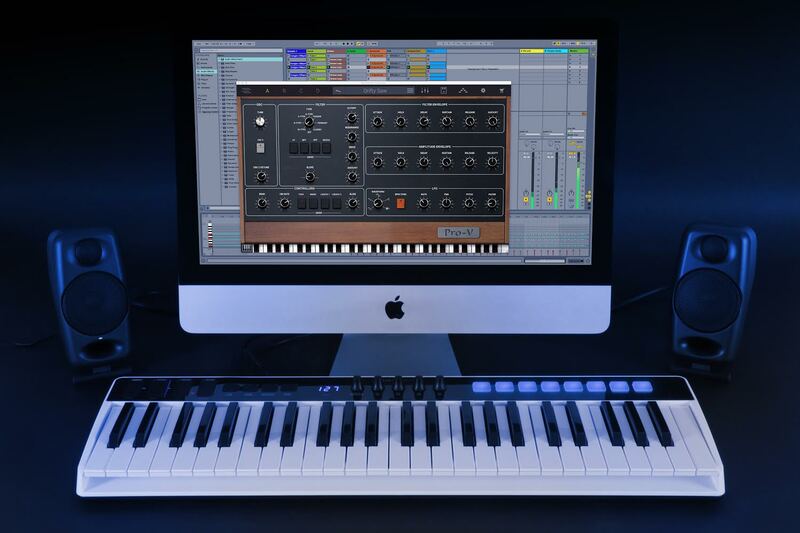 There are some preset configurations setup for common uses such as IK’s own virtual instruments or with Logic Pro/Garageband. Using midi learn from the software or app you are using it is easy to set up the pads and controllers with your own presets and save these in one of the 99 available user presets memory slots. The pads can be used for note messages but these can also be set to send midi control changes or even program changes if you wanted to easily switch between sounds on the fly. The 4 rotary knobs and data knob are infinite turn type in that they will continue to turn after the max or minimum value is reached. At first, I thought this might make it difficult to know where the knob is set when performing. Luckily each of the knobs is touch sensitive so that simply touching it without turning will display the current parameter value for that controller on the display without changing its setting. The build quality seems good with the keys, pads and knobs all feeling pretty sturdy. The pads light up different colours depending on how hard you hit them. Functionally this is fairly irrelevant but it does look nice in a darkened room. One omission to the feature set is that there is no stereo input so anyone looking to use this as an audio interface with a stereo synth, Teenage Engineering’s pocket operators, Korg Volcas etc. will be disappointed. This does seem like an odd omission given that the iRig Keys is marketed for the portability factor yet is not going to be able to interface with any of the myriads of other portable music making tools that have a stereo output. IK may have missed a trick here in terms of appealing to those wanting a truly compact portable set up. The included device stand is a nice functional addition but will likely necessitate stripping off any case you may have on your iPad or iPhone for it to fit. The keyboard I found very responsive and easy to play but on the pads. I found I had to hit harder than expected for full velocity even on the lowest velocity sensitivity setting. This was fairly easy to get used to though. I did encounter some latency when monitoring from the headphone output recording a guitar into an iPad DAW. I was able to resolve this by using the iPad headphone output instead of the one on the iRig Keys I/O. This latency issue could have been solved if IK Multimedia had included a direct monitor switch like the one included in their iRig Pro Duo audio interface for this very issue. There is no aftertouch on the keyboard, so if that is an important factor you may want to look at a separate keyboard and audio interface. Overall the iRig Keys I/O is a solid and affordable option for singers, guitarists and bass players that want an all in one option for keyboard, controller and audio interface. It will appeal less to anyone wanting to get a stereo signal from an external device into their Mac/PC/iPad or anyone that has already purchased some of the bundled software previously. That said, features like stereo inputs (and aftertouch, see above) would have likely made the product considerably more expensive. I suspect much of the value judgment for people considering purchasing the iRig Keys I/O will be in the included software and apps. Per IK Multimedia these are $550 worth with the 25 key and $750 with the 49 key. These include Sampletank, T-RackS, Syntronik ProV and Miroslav Philharmonik 2. At the time of writing, the iRig Keys I/O is the only portable all in one controller and audio interface device on the market. The concept of a combined controller and audio interface along with the included software will not appeal to all but certainly will to many who want fewer components and a smaller footprint for their mobile recording. 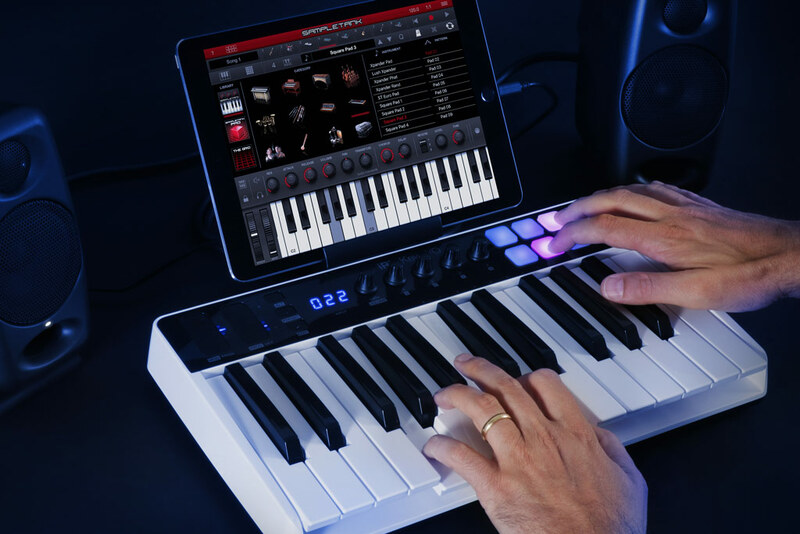 You can learn more about the iRig Keys I/O on its official web page. Written by Stuart Kilbride aka Red Sky Lullaby, a musician and sound designer from upstate NY producing music mainly on iOS devices. Check him out here and on YouTube.